The Plan was to climb First mother, Fay and Castle on Friday. Backpack up to spray and then climb Hessong Rock and Pleasant. Camp in spray and climb Observation Rock and Echo rock. Plans didn't go exactly like that but I had an amazing time with some great people. 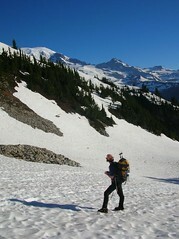 I guess 4 summits out of the 7 is ok.
Met Jeff at Mowich lake Th and started up the climbers trial to knapsack pass. 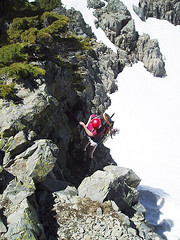 There is a climbers route a few hundred feet form Knapsack that leads to Fay. We went up to knapsack and knew we went by it. Funny thing is I saw the trail . At that point we where so close to First Mother and didn't want to drop back down so we decided to head up First mother 6395'. Nice peak. We sat up there for an hour or so. The mountain was out more than in. the storm was rolling in and gave some relief from the sun. We decided we could add Fay to the Hessong Rock and Pleasant loop for Sat so we decided to Take the ridge running NW to Castle. We pick our own bushwack route across the ridge. We would pick up the path and goat trials every once in a while. 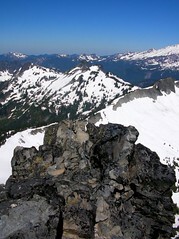 We took a wrong turn around this unnamed peak and ended up summiting it and getting cliffed out. We climbed back down and found the way around it and summited Castle peak 6110'. After a quick break we headed down. The weather system was settling in for the night. Got back to camp and set up the condo at Mowich camp ground. Denise showed up around 10:00 pm. 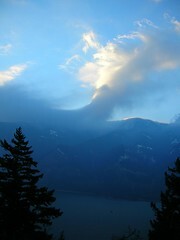 Sat morning we woke up to Rain and cloud ceiling below the lake. We decided to wait it out and see when it will lift enough to head up. I knew the system wasn't going to last long so we decided to Wait til the storm cleared to head up to spray park for the climb the next day. We can do the other three peeks another time. So we had some time to waist . We hung out in the condo and enjoyed each others company and drove down to Wilkenson for lunch. By the time we got back from lunch the weather was lifting. Packed up camp and the backpacks and headed up to Spray Park. What a great fun day. WARNING skeeters are thick in the meadows! The meadows are in full boom. By the time we got to spray not a cloud in the sky. The moon was out and just and incredible view of rainier and the sunset from camp. Sunrise was just as good. ended up on a steep snow and ice it was fun climbing up that. There was troughs of ice weaved all throughout the glacier and you can avoid most but there was many times I was glad to have my crampons. Observation 8364' is a fun scramble. Signed the summit register and saw Don's name in there. Several pairs of climbers summiting after us. We sat at the top for an hour and could have hung out for many more. Meanwhile: Denise was doing her own climb fallowing our route up the snow fields to about 7500' and enjoyed rambling around the area. We stayed in touch with each other through two ways. Had to get to Echo. 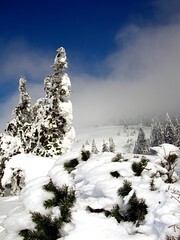 The decent was mainly snow field. 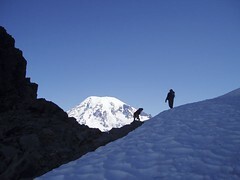 we descended the route that the other climbers had been using to get up observation. We dropped our pack and headed up Echo. We brought the helmets for echo but we used them the entire climb most of the because most all routes where littered with rock. 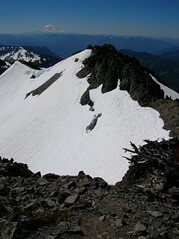 The summit of echo 7870' is tiny high and exposed . but a fun scramble. Decent was fun through the old moraines and Flett Glacier. We got back to camp and packed up and headed out. It was one of the most enjoyable weekends I have had. As I drive east down the gorge my truck is being shoved and pushed by some very violent winds. I think to myself hmmm maybe I should change plans. I know that Dog mountain gets some pretty heavy winds. I really have my heart set on dog for the day. 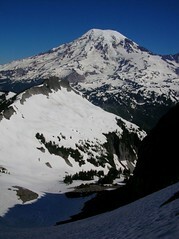 I have hiked this mountain several times but never in the winter yet. So I decide I am going for it. I arrive at the parking lot at 7:45 am. 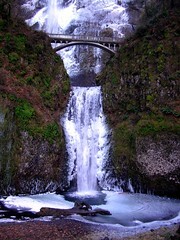 This hike is one of the most popular in the gorge during the summer. 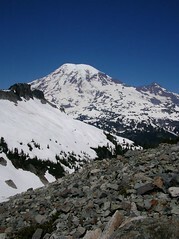 It is also used as a conditioner for scrabblers, climbers, and the Mazama’s. There are a ton of people on the trail in the summer. I have always wanted to get up there in the winter. I am glad I did. It will be my favorite time to climb this one from now on. It starts out at 150' and d switchbacks up. Then there is a fork in the trail about a mile in. Go to the right and it is less difficult but longer with views. Take the left fork and it is more difficult(not hard at all) with no views. The sun was coming out and playing with the windswept clouds so I picked the easy way. I am glad I did cause the clouds where so cool to watch. The winds in the gorge were sweeping and pushing the could so fast that I would look and then look again and they would be so different. Some of the fastest moving clouds I have seen. I t was really cool to watch. Snow patches started around 950' and solid snow at 1500'. I arrived at the old lookout spot and the wind was crazy. I found shelter to take a couple of shots of Dog and cool down. The temp at this point was 22 degrees. I had been trying to keep my body heat and sweating down so when I get to the top in that wind I would not get cold. I continued on and met up with the guy who showed up right after I left the trail head. He took the more difficult trail. He went ahead of me. We reached the open traverse and I stopped to bundled up. The wind was biting stinging every inch of exposed skin. I was like, this isn’t that bad at least I can still hike in it. The wind was blowing around 45+ mph at this point. As I reached the spot on the trail that one would turn up the ridge the wind knocked me down to the ground. I stood again and was able to stagger a bit and then was knocked down again. I stayed down on my hands and knees for a little bit hoping it would slow a bit. Not a chance the wind had to have been blowing at 45-50 with gusts of 60+. It was nuts! I could not stay on the trail and kept getting blown off. I pretty much crawled to a sheltered spot behind a tree at 2800'. Whew! I was laughing so hard I had tears that where freezing to my face. It was funny. There was no way I was even going to bother with the last .2-.3 miles to the summit. The spot I was at was just fine for me today . Plus I have been on the top of this many times. I sat and watched the clouds blow around me and the summit. The guy that I met down lower also decided not to go the rest of the way. I am telling you all it was crazy. His snow shoes that he had attached to the back of his pack where ripped out and sent down the slope. 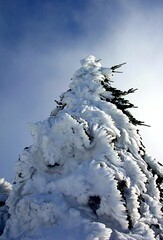 I hung out and took pictures of the awesome rhyme ice on my now favorite tree on Dog. The temp was 20 degrees. I would have hated to see the wind chill . My fingers would instantly freeze when out of there little mittens. 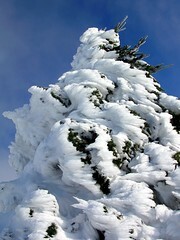 notice the snow and ice that has been plastered to the back side of the trees by the wind. It was about 1.5 - 2' thick. I headed back down after hanging out for about 45minutes. I crawled down to the end of the ridge and was finally able to stand at this point. I met a few people on the way down and it was the wind that was the topic of conversation. I will go back when the forecast for the winds is better. 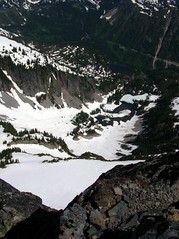 It was a great hike and I never used my crampons but I did slip and fall a couple of times on the way down. Just cause I was too lazy to put them on. 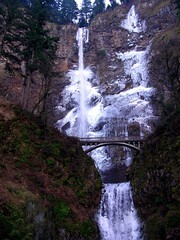 I was back at the truck a little after 11 and had time to go check out some of the falls that have been freezing up in the gorge. Dicey, Mark and I have been planning to get out together for a few months now. 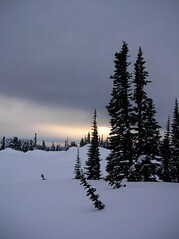 Dicey came up with an idea to go to Mazama ridge at Rainier for an overnight, snowshoe, ski, board trip. This was perfect cause I don’t want to spend $ on resorts this year. I have not been on my board for 3 years, so I was pretty excited for this trip. I asked Action betty if she wanted to join us. I figured this would be a great place for her first back country experience. AB invited another Nwhikers member Aussie to join us. Lucky Mark he gets to hang with 4 cool gals . So plans have been set for a month, till two weeks before the date I somehow tweaked my neck again (old injury [slipped disc] from 10 years ago). After getting an MRI last week, the doc told me I have a herniated disc and a bunch of bone spurs causing pressure on a nerve and might need surgery . He told me that going boarding was not a good idea. If I where to fall just right I could do some serious damage. 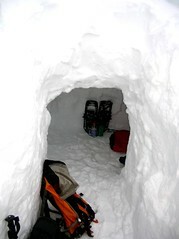 BUT he didn’t tell me I couldn’t snowshoe or build a cave . There was no way I was staying home! We all met at the parking lot of Longmire and picked up the permit for camping. The road all the way from the entrance to the park was packed snow and ice. The parking lot at paradise was as dry as could be. The weather was grey flat overcast and the mountain was not out. We started out heading down the one was road from paradise. 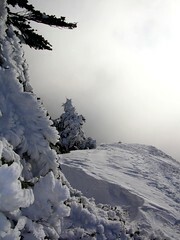 The trail was well packed down by skiers and snowshoers. Once you cross the stream at the bottom of the valley you can hang a left and cut up to the ridge from there. There was a well packed path here too. Dicey Mark and Aussie tooled up and I stayed back with AB. The board she was carrying was quite awkward and heavy . I am kinda glad I didn’t have my board to huff up hehehe. Once we reached the ridge top to AB’s relief, Aussie came down and took her board up the rest of the way to camp. Dicey and mark found a great place to camp. 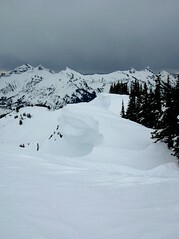 Great views of the Tatoosh range and a good slope for digging a snow cave! 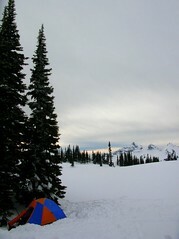 After getting their tent set up dicey, Mark, and AB took off to get some turns in. 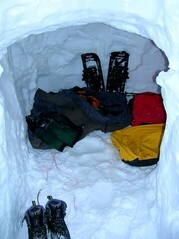 I stayed to dig out “The Cave”. Aussie stayed with me to help dig. I told her she didn’t have to help me and she could take off to do some snowshoeing. She still stuck around to help. She rocks! She was so much help. Thank-you very much for your help! I had been dreaming about this cave for a week now. I knew I was going to be stuck at camp not being able to board so I had a plan. I wanted it to be big enough for AB and I to sit up from our sleep position. I also wanted plenty of room for Dicey and Mark to come in and sit with us later in the evening when it got colder. We stared to dig and dig and dig and dig and......well you get the point. 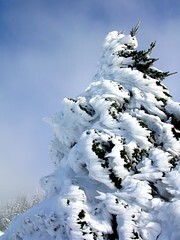 The snow was great! The first 2.5' - 3' was fresh fluff. Then a layer of 2+" ice, this would be our ceiling. 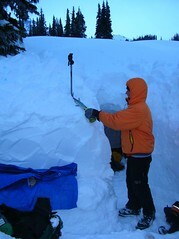 Then a 2-3' layer of compact snow. Then another 2" ice layer. One would dig out and toss it to the entrance then the other would dig and toss it out of the entrance. Quite the project! A few hours later AB shows up and relieves Aussie. Aussie and I were almost finished with the cave part. Aussie headed back to the TH. Aussie, thanks again, I enjoyed your help and company. I hope we can get together again. An hour or so later we finished digging the dining area. When exiting the cave you walk into the dining area with a large cooking table a bench for three and a captains chair. 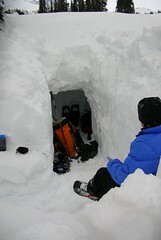 It took 3.5 - 4 hours to complete a great snow cave and hangout area. to the right is space enough for two to sleep and sit up. Mark and Dicey arrived just in time to set up for dinner and cheeze. We all hung out in the dining area and enjoyed the evening. Dicey took a couple of runs in the dark on AB’s board. Later we all went inside the cave for a warming up. I blocked the entrance with large blocks of snow and ice. It got up to 45+ degrees in the cave with the stove going. (A hole at the top of the door was used for ventilation). We hung out for a while by the light of a green glow stick. AB and I had a comfy night in the cave It was 35 degrees in there when I woke up. The morning was quite nice. The sun was trying hard to work its way through the clouds and the mountain was out. Things were still grey and flat though. After breakfast dicey Mark and AB headed down the ridge a bit and I headed up the ridge for some snowshoeing. It was sooo pretty up there I wished the lighting was better. I reached the high point of the ridge 6300' and waited for dicey and Mark to meet me at the top. We all met back at the camp and started to pack up. The demolition of the cave was quite fun and some work (well built ) . Mark and Dicey jumped on the roof to get it to collapse. I didn’t get any shots of this I hope AB will post some. It was quite funny to watch them disappear into a hole in the snow . Fun times for me . 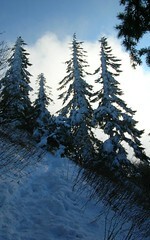 I couldn’t snowboard but I was happy to get some good exercise digging and snowshoeing. Being in such a beautiful spot as Paradise area in the winter. I completely enjoyed the company of 4 great people. I couldn’t ask for anything more. Thanks all! This trip had a first for each of us. MY first class 4-5 rock climb on a peak. It was Spotly’s first lead on summit rock on a peak, Ab’s first real glissade and first time using her crampons. After ideas/plans to climb Unicorn peak with another climber fell through on Thursday morning. I had resigned to the fact that till I find someone who leads rock I would not be climbing Unicorn. I have only climbed top rope at crags, never on a peak that needed a lead. So my plans altered. Then I get a PM from Spotly looking for beta on Climbing Unicorn and that he was thinking of going solo. Well now if that didn’t just fall into my lap! After some planning Unicorn was on! 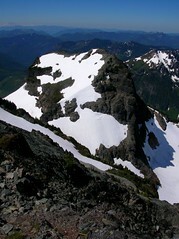 AB and I planned on doing some climbing around in the Tatoosh range on Sat. I figured it would be a great place for her to strengthen her climbing skills. One thing stopped us from that plan. AB locked her keys in her rig with all of her gear at Longmire . 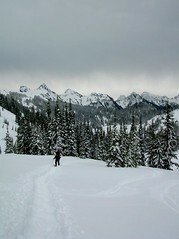 After dealing with her keys in the truck we got a late noon time start up the snow lake trail. We set up camp and had a relaxing time in the shade for a bit. We climbed up the steep chute and had dinner up higher with great views. AB finally got to use her crampons. She did really well up and down the chute and decided she was going to climb up with us as far as she could on Sunday. We woke up Sunday morning and started up the gully to meet up with Spotly. An inversion through the night and kept the snow pretty soft but not soft enough to not use crampons. The chute is about 30 degrees right now and in fine shape. We met up with Spotly at the top of the chute. Headed up towards the saddle. shot of Unicorn from the basin. last steep climb before the saddle. The pitch on the final climb to the saddle became very steep. AB had a moment of “I am freaked” but worked through it and plowed her way up. Once reaching the saddle there is a great view looking towards Adams. 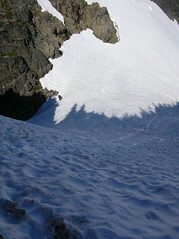 AB stopped here because the next step was to gain the ridge. This is a very nice shot taken by Spotly at the saddle. the route as seen from the saddle. of coarse the big one always there in the background. 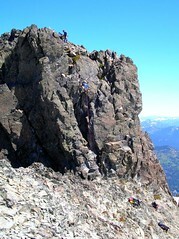 To gain the ridge one must climb and traverse class3-4 rock. The exposure was high. A big DEEP moat directly below me didn’t make it feel any more comfortable. Spotly took the lead heading strait up the class four section. Then I started to follow his route and saw a nice class three spot. It was a little sketch but fun all at the same time. From the ridge we climbed a snow field on the east side. 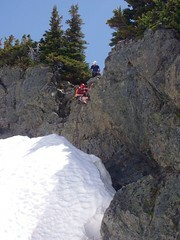 Then we climbed over the ridge and climbed another snowfield on the west side. 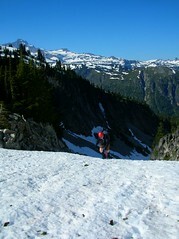 This snow field had some exposure but not too steep. 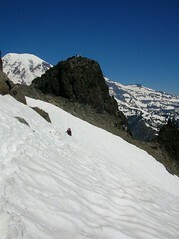 We dropped down onto the east side of the ridge again onto an exposed snow traverse. Spotly’s favorite part of the trip...NOT! This took us strait to the summit block. There are several routes up the summit block we chose the easiest route. It is a class3/4 section then traverse over to a class 5 crux and then up some more class 4 to the top. After Spolty climbed up and placed a couple of pieces of pro in it was my turn. I was a little nervous for the first time as soon as he said climb on. It has been a long time since I have been roped up on class 5 rock. I climbed up the class four then scooted over to the class five section. Right in the middle of the class five Spotly put in a bomb proof piece. I could not get it out. I tried and tried but it was in there really good. We decided to leave it and he would rap down and use his cleaning tool to get it out. It was over so fast I wanted to do it again and again. What a blast! I had forgotten how much I love to climb rock. After a few minutes on top we set up for the rappel. There was a group of 8 or 10 that where a part of a class that had started there way up the same route. Spotly asked the lead if he could grab his pro. I rappelled down the 5.6 roof pitch and Spotly stayed up there for his pro. The rappel was so fun! It took me a while to loosen up till a guy down below reminded me to trust the rope and let it do the work. Things you forget in time. Spotly meanwhile is still waiting for his pro. I felt bad but felt better when the first guy tried but could not get it either. The next guy had a tool and was able to get it out. Then it was Spotly’s turn to rap down. 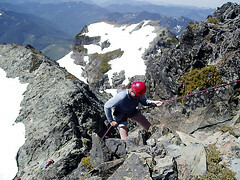 Spotly rappelling off the summit. Yahoo we did it! I think we worked pretty well as a team of first timers. Spotly you are a great lead! I was comfortable with climbing with him and to me that is important. Then it was time to head back to Denise waiting at the saddle. Once we got back to that nasty rock traverse I found an anchor to rap from. I wanted to rap down it. Spotly looked at the anchor and decided to add a backup and rap ring. Rappelling down that was a blast!!! 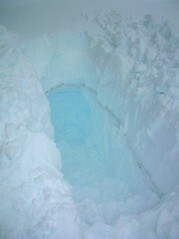 We rappelled down to the moat and climb out of it using a big chuck of snow that was stuck down in it. Then finish the rap down the snow finger to the saddle. So much better than down climbing it! From the saddle we had to drop down that steep slope. AB was still a bit freaked but took it slow and made it down. Then Spotly took off. He had a long drive back to Spokane. We started down into the bowl. Glissading is the best way to get all the way down. AB started her glissade and I plunge stepped for a bit then glissaded myself. Then it was time for the chute. I figured it would have softened up a bit more since the morning so I decided we could do it without crampons. I was wrong It was still a bit firm for just boot IMO. So this is when I was stuck. It was too steep to be taking my pack off to put on my crampons. I was freaked out about Glissading it. I have this Huge fear of Glissading steep snow now since I had a very bad accident on a sled hitting several trees and rock at 30+MPH and ended up in the ER. I still have injuries from it. 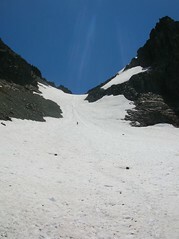 I don’t like steep snow and the thought of sliding on it was freaking me out. AB is the one who talked me into the glissade. I told her if she did it first then I would She did it! Now I had too...me and my mouth . 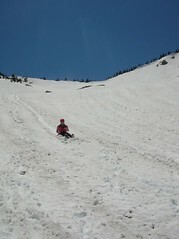 We both did a slow glissade through the chute and then gained speed as the pitch let up a bit. This was a huge step for me because I have been scared of Glissading since the accident and avoid it like the plague. I need to do it again and again to get over this stupid fear. Thanks AB for the encouragement. We went back to camp, packed up and headed back to the cars. I had tried this peak before about 5 years ago with Mania and it was in August. We got turned around at the saddle due to a huge moat and poor access (scary loose class 4 rock) to the ridge. This time of year is the best for this climb! All of the nasty scree and talus is covered in snow. We were on snow 95% of the time. 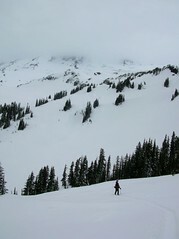 The Glissade is great from the saddle at the top all the way down to Snow lake. The summit block is quite solid and has some great routes on it. What a great climb and weekend it was for me. Thanks again Spotly for your great lead, company and images for the tr. AB you did great! Each time, you go father and get better! I now have been reminded how much I LOVE to rock climb. I had forgotten just how much I love it.